WASHINGTON — NASA announced Nov. 14 that it has extended its unfunded agreement with Blue Origin to support to that company’s effort to develop a commercial crew spacecraft, even though the company is not competing for a NASA contract to provide transportation to the international space station. NASA and Blue Origin signed an extension Oct. 31 of their existing Space Act Agreement, originally part of the agency’s Commercial Crew Development Round 2 (CCDev2) award made in April 2011. This extension, like previous ones dating back to February 2013, is an unfunded one where NASA provides technical guidance but no money to Blue Origin. One milestone covers an in-flight test of a “pusher” escape system, where rocket engines at the base of the vehicle would push the spacecraft away from its launch vehicle in the event of an abort. Under the CCDev2 milestone, NASA personnel would review data and video from the test, which would use an unspecified subscale booster. 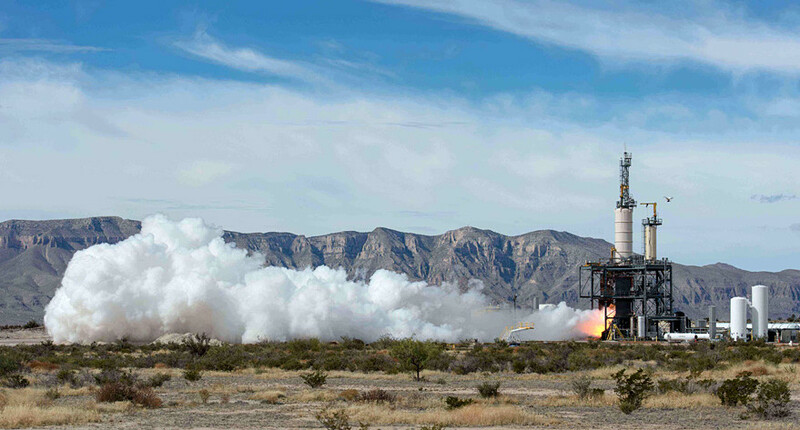 A second milestone involves a flight test of Blue Origin’s BE-3 rocket engine, a liquid oxygen/liquid hydrogen engine that the company has tested on the ground in earlier milestones. That flight would test the engine on a “representative suborbital mission,” which NASA personnel would be invited to observe. The third milestone involves a flight test of a subscale propellant tank, also on a representative suborbital mission. The assembly review for that tank was a milestone in a prior unfunded extension of Blue Origin’s CCDev2 agreement. The extension states that the BE-3 and propellant tank milestones would be achieved by September 2015, while the pusher escape system test milestone is scheduled for March 2016. The overall agreement now expires April 17, 2016. “The team at Blue Origin has made tremendous progress in its design, and we’re excited to extend our partnership to 2016,” Kathy Lueders, manager of NASA’s Commercial Crew Program, said in the Nov. 14 statement announcing the extension of the Blue Origin agreement. The CCDev2 program was originally established to help companies mature technologies for commercial crew transportation systems that would feed into later competitions for the development of systems to carry NASA astronauts to and from the ISS. Boeing, Sierra Nevada Corp., and Space Exploration Technologies Corp. also received funded CCDev2 awards. While Blue Origin received $22 million in its original CCDev2 award, it decided, unlike the other three funded companies, not to compete in later phases of the program. Instead, the company has continued development of what it simply calls its “Space Vehicle” using internal funding. In September, NASA awarded contracts valued at up to $6.8 billion to Boeing and SpaceX to develop and test their commercial crew vehicles, a decision that Sierra Nevada has protested to the Government Accountability Office.